While you may have thought that dinosaurs went extinct millions of years ago, they’re actually living in your back yard today – birds are dinosaurs! This fact was not known until scientists were able to correctly reconstruct their family trees and figure out the evolutionary relationships that placed birds squarely in the same group as dinosaurs like T. rex. But how did they do this? Dr. Daniel Ksepka, a paleontologist and systematist at the National Evolutionary Synthesis Center in Durham, NC, talked to teens about the field of phylogenetic systematics in Raleigh, NC on February 1, 2013 and Chapel Hill, NC on March 22, 2013 as part of the Open Minds Café series. The teens in attendance learned about the principle of parsimony (Occam’s razor), classification of groups of animals based on shared physical characteristics, and the practical applications of evolutionary trees, such as determining the origin of the SARS outbreak in China or figuring out the proper antivenin to use on a snakebite victim. Dr. Ksepka engaged them with real-life examples and fun stories from the field, and they learned important concepts in the study of evolutionary biology. They also practiced skills that are fundamental to any scientist studying the evolutionary relationships of organisms, as Dr. Ksepka taught them how to build a phylogenetic tree working as a group and then challenged them to classify their own set of “organisms”. An audience member draws the best evolutionary tree. Photo by Jennifer Li. Contributed by NC Open Minds Café. Dr. Ksepka adapted a lecture and activities that he developed for his college-level course on phylogenetic systematics to teach the teens, and they had no problem following along – he joked that some of them even picked it up more quickly than his undergrads! To start with, Dr. Ksepka introduced them to a group of turtles that he had created to teach the skills needed for the activity and asked the students to come up with characters (or characteristics) to classify the turtles. 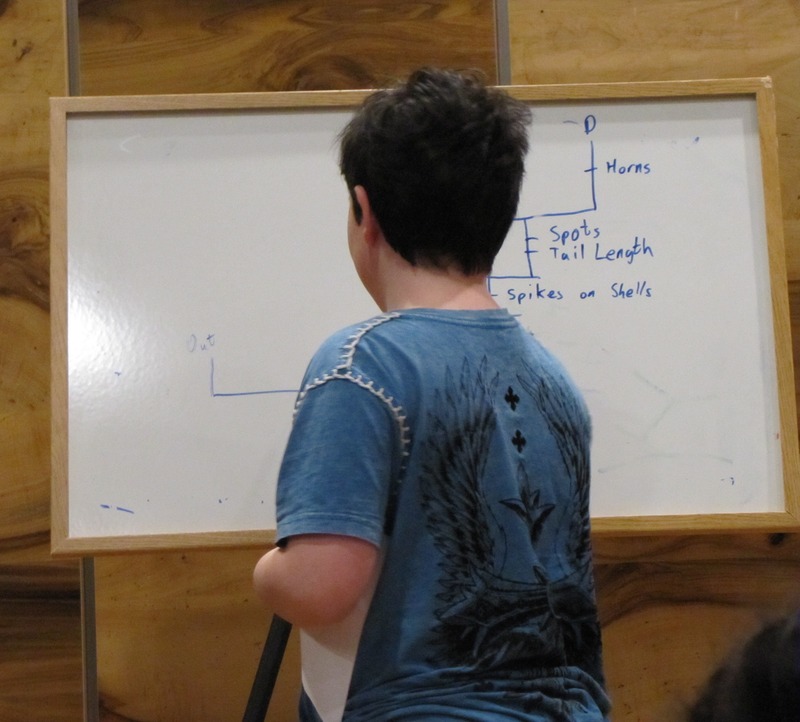 He wrote the characters out on the board, and then he asked the students to code the turtles for those characters and attempt to draw the best evolutionary tree on scrap paper at their tables, after which he had a volunteer come up to the front and draw the best tree and label the character state changes. With this practice run completed, we passed out the handouts “Systematics of Mysterious Metal Animals” and let them classify sets of screws. These sets had one of each of 7 different types of screws in a small bag so that each group had the exact same collection. The students worked in groups to make up characters, code the screws, and come up with the most parsimonious phylogenetic tree with the character state changes labeled. This activity allowed them to apply the concepts learned in the presentation and to discuss them with each other. Dr. Ksepka went around to each group to provide assistance and feedback as they worked.